We've been a fan of Weruva® cat food since we were kittens. We were given a can of the Paw Lickin' Chicken by Mom Paula's boss and we loved it from the first bite. 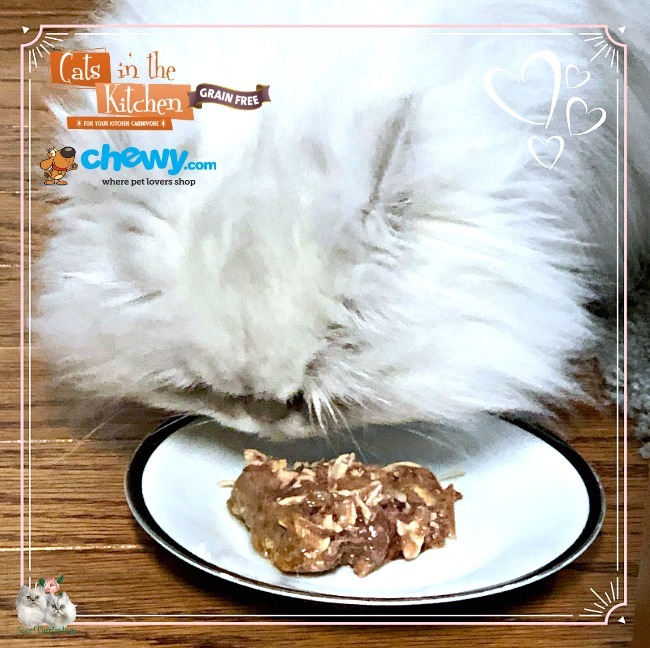 Mom Paula was impressed with this grain-free wet food made with protein as the first ingredient. Mom Paula even tasted this food at BlogPaws® a few years ago - quality food so good, even humans could eat it!!! Weruva developed a new line of cat food called Cats in the Kitchen which they promote as feeding your cat like a member of the family. Weruva states that "if cats could cook, they'd whip up these delectable dishes in the kitchen..." These recipes are available in both cans and pouches and include land and sea proteins like boneless and skinless white breast chicken meat, lamb, and fish loins. One problem we've always had with Weruva is that many of our local pet stores don't carry this brand and we've had to order it online from Chewy.com. We love the variety of products, the convenience of ordering, and the quick delivery from Chewy.com. but we'd have to order a case of the same recipe, which didn't give us the chance to try out the different flavors to see which we liked. Imagine our surprise when Chewy.com notified us of the variety pack from Weruva called Cats in the Kitchen Goldie Lox and the 3 Fares Variety Pack that was part of the Chewy Influencer program this month. This particular variety pack includes Chicken Frick 'A Zee (Chicken Recipe Au Jus), Funk In the Trunk (Chicken Recipe in Pumpkin Consomme), Goldie Lox (Chicken and Salmon Recipe Au Jus), and The Double Dip (Chicken and Beef Recipe Au Jus). There are six cans of each flavor in the case. We really like food that includes chicken and weren't disappointed that all of these recipes included chicken as one of the first ingredients. We're not big fans of beef, but loved the other flavors. Our favorite from this variety pack was the Goldie Lox because of the salmon included with chicken. Salmon is one of our newest favorites and we don't get it too often because Mom Paula limits our intake of fish products. As you can see from the photo above, both Truffle and Brulee began eating as soon as the plate was put in front of them. Most of you know that Mom Paula needs to monitor the food that Truffle eats because of her bladder stone surgery last year. Weruva Cats in the Kitchen includes high-quality protein inside a delicious gravy, which can help her stay hydrated. She eats this type of wet food alongside her prescription kibble and is doing well now. We will continue to monitor the pH levels in her bladder. Convenient, easy-to-open cans tha feature gourmet recipes that are high in protein and low in carbs. The recipes contain no grains, gluten, potatoes, GMO ingredients, MSG or carrageenan, so it's great for cats with allergies. The variety of flavors help to entice picky eaters with real, deboned meat in a luscious gravy. The recipes help cats stay properly hydrated and can be served as a standalone diet or as a topper for dry food. We were very happy with this food and will definitely purchase more in the future. 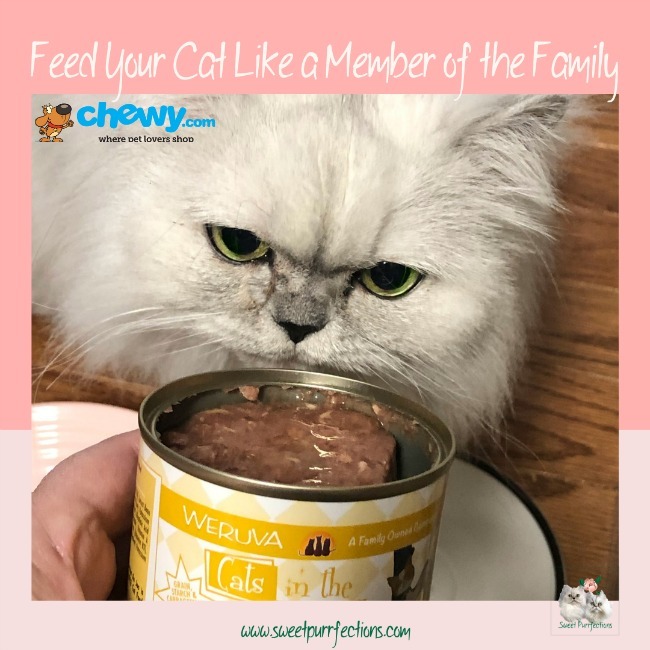 You can purchase the Weruva Cats in the Kitchen Goldie Lox and the 3 Fares Variety Pack Grain-Free Canned Cat Food at Chewy.com for $44.99 for a case of 24 and can save an additional 5% if you select Autoship for regular deliveries during checkout. I'm glad this food works for you kitties! That company does make some pretty yummy foods! We love Weruva too. Petco is carrying more of their foods now. Check a local independent pet store if there’s one in your area. This is such a fantastic product. We do have a couple that are carrying it. Petco is beginning to carry it now, too. Glad it was a hit. I need to try this for my kitties. Good info, really nice that you can pick flavors. Thank you for always sharing your wonderful reviews. We are happy to see that it was a hit. Food that is so good a human can eat it. Looks very yummy and we are looking to try something new for our little babies at home. Have a great day. Some of my cats love Chicken Frick 'A Zee. Most of the other Weruva flavors, not so much. One of the things I *love* about Weruva is that the nutritional information on their website includes the percentage of carbs in each flavor. That's very helpful information for someone who's feeding a diabetic cat. I'm not familiar with that company but it sure sounds like they make quality foods. I agree with you about wanting variety, I like when the 10 or 12 packs come in different flavours rather than all the same. We like variety, so why should our pets get that same luxury! You must be relieved it's good for Truffle as well. I've heard good things about Weruva before, although I have dogs rather than cats. I'm glad the brand works well for your furry family members. Great review! Variety is so important to their diet - it gives them all the nutrients they need when they eat different things. Thsi is the brand I feed my cats they love this food. A bit expensive but we do everything for them don't we? We are big fans of Weruva - the kitties and unfortunately, Ruby who likes it, too! I have to remind her that she is not a cat. LOL. Rosie and Teddy enjoy the chicken, and the salmon and beef. They recently tried the lamb and LOVED IT! The food sounds really good and I use the Weruva pumpkin for Layla all the time, I am fortunate to get it at my petstore. It is great to find a food that your pets like and that you feel good about feeding them. My cat enjoyed most of Weruva food that we gave him. That stuff looks delicious! I know your cats would adore it and I wish I could get it here!! Truffle and Brulee are discerning eaters and I know they will not eat stuff they don't like! Our next door neighbor's cat absolutely loves this food! We feed it to her when her parents go away on vacation. Nice pick going with Weruva! I must say we’re huge fans of Weruva cat food! I started feeding the seniors this food and Earl Grey especially was a huge fan. I don’t buy it often as with 9 cats it can be cost prohibitive, but it’s something that is included in our monthly cat food rotation. Mom says I haven't tried the variety you mention here. I have tried other Weruva moist noms in the past and turned my nose up at them. She says I'm very purr-ticular about my foods. I just know what I like, that's all. Mom would luv for me to eat Weruva foods, 'cause they are rated very well.